So, I first heard about elimination communication (EC) from a friend’s mom who was visiting Istanbul earlier this year. She’s a home-birth midwife and this was something she mentioned. I remember thinking the idea of little babies being ‘potty trained’ and pooping and peeing in little containers sounded a bit mad, and that was that. 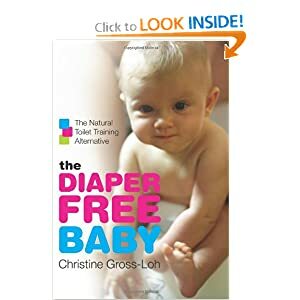 However, later, while looking into cloth diapering and related things, I came across the idea of EC (or natural infant hygiene or whatever else you might call it) again, and became rather intrigued. I obviously liked the idea of having fewer diapers to change, and then on the environmental side of things, fewer diapers used means fewer diapers to wash, less detergent and cleaner, etc., so it’s more environmentally friendly. And also, it’s about learning to communicate better with your baby, reading his signals for when he needs to go to the bathroom and helping him to stay aware of his body functions rather than getting him used to pooping and peeing on himself and then trying to retrain him when he’s a toddler. So, I ordered this book and decided I wanted to give it a try. Well, I started out pretty much right away with cueing Liam when I knew he was pooping or peeing, which is the first step, but when he was so small, I felt too awkward holding him over something to go to the bathroom in. He just felt to floppy and fragile, so I didn’t really go beyond that. I tried having diaper-free time with him on a water-proof mat on the floor, but wasn’t really getting any clear signals about when he needed to go. I felt a bit intimidated by the whole thing and also just a bit afraid that if I tried it he’d just make a bit mess everywhere. So, I just stuck with a bit of cueing, and left it at that. Then a couple of days ago, I was looking at the book again and talking to Richie about us giving EC a proper go. Over the past couple of weeks Liam has become so much easier to handle, not such a fragile little newborn, and he’s also a bit more communicative. Also, last week there were a number of occasions where, when I changed his diaper and let him air out a bit on the changing table before putting a new nappy on, it’ would be obvious he needed to pee again, so I was just sort of waiting for him to do it, and sometimes trying to cover him with the old diaper to avoid wetting and having to change another brand new one. A good few times, as soon as I’d get the clean one on, he’d pee, so I figured, I can tell when he needs to go in these situations, so rather than waiting for him to go in a diaper I might as well hold him over something and see what happens. So, on Monday, after talking about it, suddenly I just switched gears and gave it a shot. On the first day, I caught 3 pees. Then the next morning, after his first feeding, I caught a pee and a big poop. Richie came over to help me with the logistics of clean-up while I was holding Liam, and little Liam just gave a big smile which was great! Yesterday we caught a good few pees and poops, especially right after he fed or during changing time before putting on a clean diaper. Again, last night and this morning, we’ve caught a few and Liam actually seems to like it. Sometimes he fusses and gets really fidgety during feeding, and a couple of times I’ve tried taking off his diaper and holding him over his little potty-basin, and he calms down right away. Then after a minute or so, he’s gone to the toilet and seemed happy as can be. I’ve been quite excited about how things have gone so far and it’s kind of addictive! Catching a few makes me want to catch more! And we’ve already avoided quite a few messy diaper changes and that’s also fewer diapers to wash, so I’m happy about that! Anyway, we’ll see how things go and try to do a bit each day. It sounds like the key to the whole thing is to not take things too seriously or expect too much. So, I’ll just enjoy helping Liam when I can and make it a positive and pleasant experience for all of us.